Resistance to change – What if we were all wrong? Our main assumption is that change management failure is due to the resistance of employees. What if we were wrong about that? Maybe, resistance to change does not exist. This may seem to be a strong statement for you, leaders, managers or OD specialists. We know that the essence of change is the transition from a known state to an unknown state. Then why employees are not buying into the change even if they understand its necessity. What is missing in our understanding of change dynamic? Many OD specialists created models and theories to explain and improve change management but still there is a 70% of failure. What if we missed the most important part of change, human reactions? After their research Victoria M. and James D. Grady have shown that we are not resistant to change, we are just attached to the current state we live in. We feel secure when we know our environment, coworkers, pay system, and so on. All living being are attached to their current state, this is natural. When they are young animals lean on or are attached to their parents because they feed and protect them. This attachment is indispensable for survival. Human beings are not exception to this natural law. The roots of our attachment come from our childhood. As infants we made one with our mother until we realized that in fact we were two different people. We went through our first change, our first loss. In order to handle the situation, we found a transitional object on which we leaned on while we accommodated ourselves to this new reality. The issue in organizational change is that we take away an object, a person, an idea without giving the support genuinely needed by employees to go through the transition. The loss of the current state, object or idea generates different symptoms with various intensities across people. In their book, The Pivot point, Victoria M. and James D. Grady, list 6 symptoms that we can identify in individuals when a change is coming up and an attachment object, person, idea is lost. The individual reactions to change lead to collective (organizations) reactions. It seems then important to find a way to support employees during change by providing them adapted transitional object. The identification of symptoms allows a consultant to suggest support strategies before, during and after the change. Those strategies determine the type of transitional object (crutch) that people need. It is important to note that the transitional object changes from individual to individual, from situation to situation, and from organization to organization. Those symptoms can be evaluated thanks to the Change Diagnostic Index© developed by Victoria M. and James D. Grady and for which I am certified. In spite of accusing employees of being resistant to change we need to accompany them in the change by acknowledging the existence of their reaction and assist them in this difficult time. We cannot erase the emotional reaction to change but we can lessen them by finding a transitional object that our employee need. 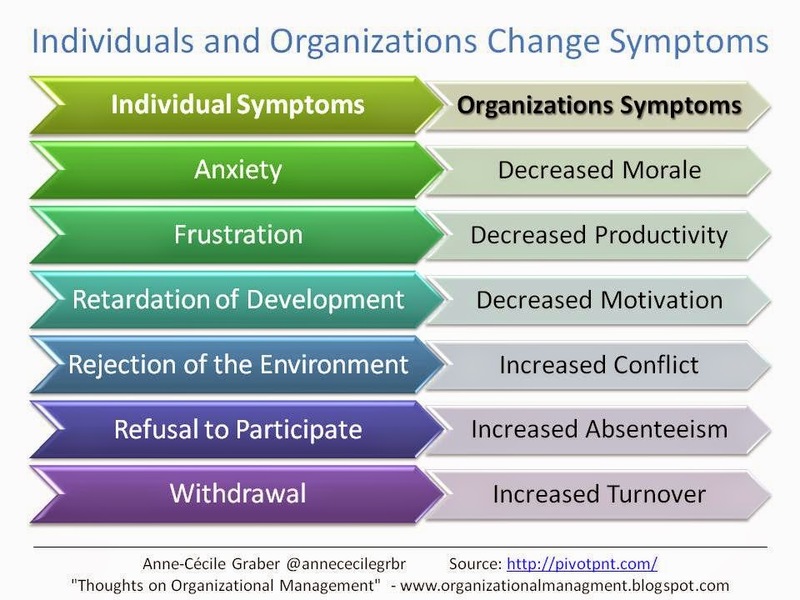 I invite you to check my post on the Change Diagnostic Index© in the The Organizational Management Toolbox – OMT. How to make change happen?